Customer relationship management (CRM) programs have a bad reputation for being overly technical, burdensome to implement, and a chore to use. This can certainly be true of some services, especially for owners of small to medium-size businesses who lack the funds or resources to customize the CRM properly to meet their company's needs. Salesforce, for example, is popular but not necessarily lightweight or easy to get off the ground. But a number of CRM programs can help you manage your company's growing data files, without requiring hours of setup or expensive visits from your IT consultant. We've rounded up five CRM programs to see which ones provide the combination of horsepower and usability that marks a great CRM. These tools live on the Web, so you can access them via Web browser from nearly anywhere, regardless of your OS. The closest to Salesforce in power and scope, Zoho CRM offers a solid platform for managing customer support, opportunities, inventory, leads, and marketing efforts, including email campaigns that you can launch from within the service itself. Zoho CRM has a bundle of features, including word processing, database functions, collaboration, and project management. In addition to what comes as part of the program, you can purchase third-party applications to meet nearly any company need. Importing contacts to Zoho CRM can be confusing. In my view, the best function of the program is the ability to track your email communications without having to CC or BCC each outgoing email message to a Zoho CRM email address. 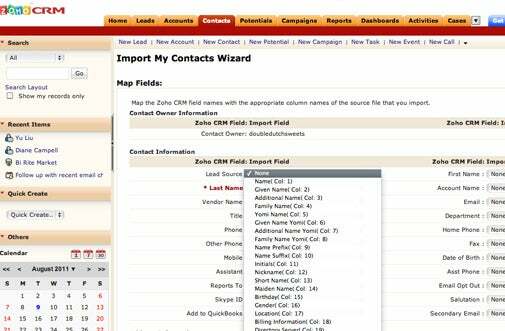 Instead, you send email from within Zoho CRM, using POP3. If you're willing to give up the native client for your email provider, this arrangement is a pretty good way to keep your email conversations organized. Alternatively you can purchase the Zoho CRM Plug-in for Microsoft Office Outlook; for $3 per year per user, it allows you to synchronize contacts, calendars, and tasks between the two programs. You can also find plug-ins for syncing Zoho CRM files with QuickBooks. For all its feature-richness, however, I found Zoho CRM difficult to set up and implement. Like many small business owners, I wear many hats, and though I am fairly knowledgeable about technology, I had trouble figuring out where to get started with Zoho CRM. The program relies heavily on jargon to describe features and functions, and this can be disconcerting if you're unfamiliar with CRM concepts. For example, in the process of importing my contacts from Google Contacts, the program asked me first to map the Zoho CRM field names with the field names of the CVS file that I had generated from Google Contacts. Unfortunately, most of the options Zoho offered were field names I had never encountered while using Google Contacts. My best guess resulted in successfully importing only 7 of my 869 Google Contacts. Use if: You want a full-service CRM, and you're already familiar with CRMs; or if you have access to support staff who can set up and maintain Zoho CRM for your company. With a great combination of features and support, Landslide blew its competitors away in ease of setup and use. Landslide provides both a giant 'Help Me Get Started' button on your homepage and a 'Getting Started Checklist', as well as personal outreach from a sales team member to ensure that your transition to Landslide is smooth. Within minutes of signing up for an account, I had received email from Landslide inviting me to biweekly webinars to learn more, as well as contact information for a live human being. When choosing a CRM tool, give the user experience just as much weight as the major features. I always find that I have fewer hours in the day than tasks to do, and I would gladly pay a little extra or do with fewer embellishments, if the resulting program were easier to use. Landslide offers a user-friendly FAQ to get started. Landslide's help section distinguishes between feature support and setup support, which is enormously useful when you're just learning the program and don't yet have specific features-related questions. Like many of its rivals, Landslide offers ready access to a sales team that can walk you through the program. But for users who'd rather tinker around on their own than call technical support, Landslide's smart, well-designed FAQ system is a lifesaver. Though Landslide's main selling point is its user experience, this CRM doesn't skimp on powerful features. It is the only service in our round-up that offers syncing with Google products, including email, contacts, and calendars. In addition, you can sync your Landslide data with data in QuickBooks and in Microsoft Outlook (including email, contacts, and tasks). In running your business, you may have built various management systems (including QuickBooks) into your workflow, and you can't readily abandon them every time you discover something new. One Landslide's many positives is that it fits into an existing framework developed around other programs. Particularly for CRM newcomers who are unfamiliar with the terminology but who still need a program with features approaching those of Zoho CRM, Landslide is a great, cost-effective option. Use if: Usability is very important to you, and you want a full-service CRM program.